Construction activities at the Amulsar Project in Armenia. Source: Lydian International Ltd.
Lydian International Ltd. [LYD-TSX] shares continued their recent slide on Friday August 3 after the company released an update on a recently reported road blockade near its 100%-owned Amulsar Gold Project in Armenia. In early trading Friday, the shares fell another 4.76% or $0.01 to 20 cents, continuing a fall that began in January, 2018 when the stock was trading at over 60 cents. 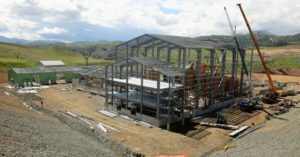 Lydian is a gold development company focused on construction at its 100%-owned Amulsar Gold Project, which is located in south-central Armenia. The aim is to build a large-scale, low cost open pit, heap leaching operation with gold production targeted at an average of roughly 225,000 ounces annually over an initial 10-year mine life. That is based on an estimated resources of 3.5 million measured and indicated gold ounces and 1.3 million inferred gold ounces, as outlined in a 2017 technical report. The company has said existing mineral resources beyond current reserves and open pit extensions provide opportunities to improve average annual production and extend the mine life. Development of Amulsar will use conventional open pit mining methods, over a minimum of 12 years. Development is scheduled to occur in phases with selective mining of orebodies. However, in its Friday update, the company said illegal blockades have prevented Lydian and its contractors from entering the Amulsar site since late June. “Prime Minister Pashinyan’s appeal instructing the protestors to discontinue the road blockades has shown limited results,” the company said. “Lydian and other stakeholders continue to petition local and national government officials to enforce the law by removing the illegal blockades and allowing Lydian to resume construction activities,” it said. As a result, Lydian has issued termination notices to 100 employees, representing approximately 30% of the workforce. Staged employee reductions are expected to continue until a permanent resolution is achieved. In addition, all construction contractors have been idled, a move that impacts roughly 1,000 contractors, Lydian said. Meanwhile, the company is working to renegotiate its credit terms. Based on the original production plans, initial debt repayments were set to commence on July 31, 2018. But the initial repayment has now been extended to August 15, 2018, indicating a more comprehensive debt restructuring and financing plan may be announced by that time. Scotiabank said in a report it would like to see the government take a firm stance with respect to removing the illegal blockades. However, the government seems to be reluctant to take action ahead of snap Parliamentary elections that are planned, but not definitively scheduled for May, 2019, Scotiabank said in a note to investors. “It is possible this fall that the successful conclusion of an agreed to government inspection program there would be the impetus to resolve the blockades, but this is not assured,” Scotiabank added. A political outsider, Pashinyan was elected in May, 2018, following country-wide protests. Blockades quickly followed that centre on environmental issues that were long settled and covered by Lydian’s permits. These protests primarily targeted the mining sector, including the Amulsar project Lydian has said. “Lydian remains firmly committed to its principles of responsible mining and transparency,” said Lydian President and CEO Joao Carrelo. “It is unfortunate that the current unlawful situation is continuing unnecessarily and negatively impacting host communities and the livelihood of more than 1,300 employees and contractors,” he said. Pre-operational costs at Amulsar have been estimated at $425 million. When Lydian announced its first quarter results in May, 2018, the company said it anticipated an additional funding requirement of $65 million. It said the estimate was sensitive to several key risk factors, including potential further changes in the schedule to achieve production, and ramp up to the point of positive cash flow, additional pre-operational costs, and upcoming contractual commitments. Without a return to work, the funding gap is expected to remain unaddressed.